Transureteroureterostomy (TUU) is a urinary reconstruction technique that is used to join one ureter to the other across the midline (see image below). It offers patients with distal ureteral obstruction an option to live without external urostomy appliances or internal urinary stents. TUU is also used in undiversion procedures when the surgeon wants to avoid the pelvis because of previous trauma, surgery, or radiation therapy. TUU can be combined with other procedures, such as cutaneous ureterostomy, in extreme cases. Requirements for performing a successful TUU include a salvageable ipsilateral kidney with a normal ureter proximal to the diseased portion. The accepting ureter must have unobstructed drainage and must not be affected by any disease process that would place both kidneys at risk postoperatively. Indications for TUU include trauma, pelvic malignancies, vesicoureteral reflux, exstrophy, and rare conditions such as amyloidosis, malakoplakia, and leukoplakia involving large segments of ureter. This procedure is seldom used if ureteral reimplantation using the psoas hitch or Boari flap is possible. Other options include ileal ureter, autotransplant, or nephrectomy. The concept of TUU is to re-establish ureteral continuity by bringing the ureter across the midline and anastomosing (connecting) it to the contralateral ureter. This is generally performed in an end-to-side or side-to-side fashion. 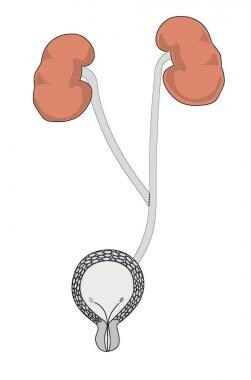 The accepting ureter must be normal because, after the TUU is performed, any disease process that affects one ureter or kidney puts the contralateral ureter and kidney at risk. TUU can also be performed in cases of a solitary kidney with a normal contralateral ureteral stump. TUU was first attempted in animals in 1906,  and Higgins applied it to humans in 1935. Since then, TUU has been performed in children and adults for benign and malignant diseases that cause ureteral obstruction. TUU is a surgical procedure used in patients who have no other option of regaining ureteral continuity. It is used only in patients who cannot undergo reimplantation with psoas hitch or Boari flap. These patients are very challenging, and proper patient selection is important. A literature search using Medline revealed 6 articles that reported fewer than 600 cases performed worldwide from 1975 to present. This number is most likely much higher considering the fact that most procedures are not reported in scientific literature. The largest modern series is from England, where 253 procedures were performed for both benign and malignant diseases that affected the distal ureter. The authors experienced 5 complications, all of which involved the common ureter distal to the TUU. Transient leak occurred in 16 (6%) patients. This emphasizes the need to ensure a normal accepting ureter distal to the TUU anastomosis. In addition, any disease process that may risk both upper units, such as stone disease, medicorenal disease, or chronic renal insufficiency, is a contraindication to TUU. Medical conditions that may necessitate TUU include trauma, pelvic malignancies, vesicoureteral reflux, exstrophy, and rare conditions such as amyloidosis, malakoplakia, and leukoplakia involving large segments of ureter. Indications for transureteroureterostomy (TUU) include trauma  , pelvic malignancies, vesicoureteral reflux, exstrophy, and rare conditions such as amyloidosis, malakoplakia, and leukoplakia involving large segments of ureter. This procedure is seldom used if ureteral reimplantation using the psoas hitch or Boari flap is possible. Other options include ileal ureter, autotransplant, or nephrectomy. The ureters are roughly 20-30 cm long and lie completely in the retroperitoneum. They have a rich blood supply, making them relatively forgiving organs on which to operate. However, meticulous surgical technique is required in diseased ureters because they are prone to ischemia with resulting stricture formation or necrosis. Intraoperative complications include injury to adjacent structures such as bowel or vascular structures. Care must be taken when the bowel is retracted because lacerations or mesentery injuries may occur. The aorta, inferior vena cava, and iliac vessels are in the operative field and must be identified and spared throughout the procedure. Previous surgery and/or radiation therapy increase the risk of injury to these organs. Contraindications to transureteroureterostomy (TUU) generally include conditions that affect both mid ureters or proximal ureters and/or kidneys. These include genitourinary tuberculosis, a long history of severe stone disease, retroperitoneal fibrosis, transitional cell carcinoma of the renal pelvis or ureter (except in cases of palliation), vesicoureteral reflux in the accepting ureter, and large luminal discrepancy in the 2 ureters. If a procedure such as a psoas hitch or Boari flap can be performed, TUU may not be the best long-term alternative for the patient. In poorly functioning kidneys (< 15%), nephrectomy may be the best option. Kawamura J, Tani M, Sumida K, Yazawa T, Kawasoe J, Yamamoto M, et al. The use of transureteroureterostomy during ureteral reconstruction for advanced primary or recurrent pelvic malignancy in the era of multimodal therapy. Int J Colorectal Dis. 2017 Jan. 32 (1):135-138. [Medline]. Sharpe NW. VIII. Trans-Uretero-Ureteral Anastomosis. I. Intraperitoneal. II. Retroperitoneal: (a) Anterior to Aorta and Vena Cava; (b) Posterior to Aorta and Vena Cava. Ann Surg. 1906 Nov. 44(5):687-707. [Medline]. [Full Text]. Higgins C. Transuretero-ureteral anastomosis. Report of a clinical case. J Urol. 1935. 34:349. Noble IG, Lee KT, Mundy AR. Transuretero-ureterostomy: a review of 253 cases. Br J Urol. 1997 Jan. 79(1):20-3. [Medline]. Leo MM, Langlois BK, Pare JR, Mitchell P, Linden J, Nelson KP, et al. Ultrasound vs. Computed Tomography for Severity of Hydronephrosis and Its Importance in Renal Colic. West J Emerg Med. 2017 Jun. 18 (4):559-568. [Medline]. [Full Text]. Lo TS, Wijaya T, Lo LM, Kao CC, Wu PY, Cortes EF, et al. Clinical Relevance and Treatment Selection of Ureteral Injury After Cesarean Section. Female Pelvic Med Reconstr Surg. 2016 Sep-Oct. 22 (5):303-6. [Medline]. Iwaszko MR, Krambeck AE, Chow GK, Gettman MT. Transureteroureterostomy revisited: long-term surgical outcomes. J Urol. 2010 Mar. 183(3):1055-9. [Medline]. Mure PY, Mollard P, Mouriquand P. Transureteroureterostomy in childhood and adolescence: long-term results in 69 cases. J Urol. 2000 Mar. 163(3):946-8. [Medline]. Kilciler M, Bedir S, Erdemir F, Zeybek N, Erten K, Ozgok Y. Comparison of ileal conduit and transureteroureterostomy with ureterocutaneostomy urinary diversion. Urol Int. 2006. 77(3):245-50. [Medline]. Strup SE, Sindelar WF, Walther MM. The use of transureteroureterostomy in the management of complex ureteral problems. J Urol. 1996 May. 155(5):1572-4. [Medline]. Pisters PW, Pettaway CA, Liu P, Matin SF, Ward JF, Leibovici D. Is transureteroureterostomy performed during multi-organ resection for non-urothelial malignancy safe and effective?. J Surg Oncol. 2012 Jul 1. 106(1):62-5. [Medline]. Dechet CB, Young MM, Segura JW. Laparoscopic transureteroureterostomy: demonstration of its feasibility in swine. J Endourol. 1999 Sep. 13(7):487-93. [Medline]. Ehrlich RM, Skinner DG. Complications of transureteroureterostomy. J Urol. 1975 Apr. 113(4):467-73. [Medline]. Elliott SP, McAninch JW. Ureteral injuries from external violence: the 25-year experience at San Francisco General Hospital. J Urol. 2003 Oct. 170(4 Pt 1):1213-6. [Medline]. Hendren WH, Hensle TW. Transureteroureterostomy: experience with 75 cases. J Urol. 1980 Jun. 123(6):826-33. [Medline]. Hodges CV, Barry JM, Fuchs EF, Pearse HD, Tank ES. Transureteroureterostomy: 25-year experience with 100 patients. J Urol. 1980 Jun. 123(6):834-8. [Medline]. Maxwell KL, McDougall EM, Shalhav AL, et al. Laparoscopic ureteroureterostomy using vascular closure staples in porcine model. J Endourol. 1998 Jun. 12(3):265-8. [Medline]. Rushton HG, Parrott TS, Woodard JR. The expanded role of transureteroureterostomy in pediatric urology. J Urol. 1987 Aug. 138(2):357-63. [Medline]. Sandoz IL, Paull DP, MacFarlane CA. Complications with transureteroureterostomy. J Urol. 1977 Jan. 117(1):39-42. [Medline].